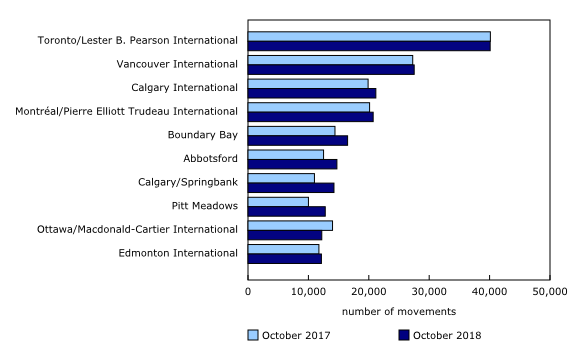 There were 500,410 aircraft take-offs and landings at the 91 Canadian airports with NAV CANADA air traffic control towers and flight service stations in October compared with 479,630 movements in October 2017. A rise in both itinerant movements (flights from one airport to another) and local movements (flights that remain in the vicinity of the airport) contributed to the year-over-year increase. Itinerant movements were up 1.4% to 348,571 while local movements grew 11.8% to 151,839. 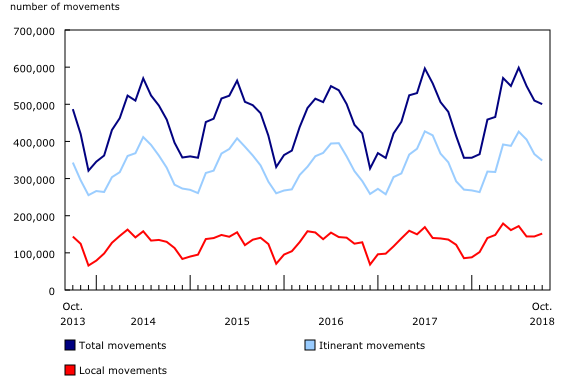 Domestic itinerant movements (within Canada) increased 0.8% year over year to 292,164 in October. Transborder movements (between Canada and the United States) rose 3.5% to 42,789 movements, while other international traffic was up 7.7% to 13,618 movements. In October, 10 airports accounted for 38.4% of total activity. Toronto/Lester B. Pearson International, Ontario, the nation's busiest airport, reported 40,091 movements, virtually unchanged (-0.1%) from October 2017. This was followed by Vancouver International, British Columbia, which reported 27,513 movements (+0.9%) and Calgary International, Alberta, with 21,168 movements (+6.5%). This survey collects data on itinerant and local aircraft movements at major airports in Canada. Major airports include all airports with either a NAV CANADA Air Traffic Control Tower or a NAV CANADA Flight Service Station. An aircraft movement is defined as a take-off, landing, or simulated approach by an aircraft as defined by NAV CANADA. Data for the same month in the previous year may have been revised. Annual estimates are released each year. The data in this monthly release are not seasonally adjusted. Additional analytical information is now available in "Monthly Aircraft Movements: Major airports – NAV CANADA Towers and Flight Service Stations, October 2018," as part of the service bulletin Aviation (Catalogue number51-004-X).